Most of us use fishing as a recreational activity. But fishing started out as a necessity for human beings rather than anything else. And what if a time comes when you’ll find yourself obligated to fish for no other purpose than to feed yourself or your family? There are plenty of survival scenarios that could happen and might force you to resort to fishing for survival. If the SHTF scenario finds you at home and prepared, with all the fishing gear you need at your disposal, good. That means one less thing to worry about. But what if you happen to find yourself stranded or you’re forced to leave your home without having enough time to pack your fishing gear too? There are water sources around and “plenty of fish in the sea” but nothing to catch them with. Well, you’re not doomed to starve, that’s for sure. There are plenty of primitive fishing techniques developed way before modern fishing that could very well be implemented today. Sure, fishing with the latest gear is preferable, but if that’s not an option, at least there are other ways that, although are unorthodox, at least they work. There is more than one way of improvising such a tool. If your aim is good enough and your hand is steady you can make a single point spear. Just find a branch or a piece of wood that’s long enough and simply attach to one end either a blade or a piece of bone that’s sharp enough to pierce flesh. A piece of durable plastic will do just as well. Simply carve enough space at one end of the branch (without breaking it) that’s wide enough to jam the point of the spear in. After you’re done, simply tie the end with a piece of rope or even duct tape and you have yourself a fishing spear. If you’re using a knife, know that exposure to water will deteriorate the quality of the metal in time, so you won’t be able to use it for much else. Another way of doing it is to simply carve the spear tip directly in the branch, by sharpening it with a blade or another sharp object at your disposal. But this won’t be a very durable result, especially if you miss a lot. Hitting the wooden tip on hard surfaces (rocks and sediments) will break it eventually. But what if you’re a bad that can’t even harpoon a shark in a fish tank? No worries, this mean’s the multi-headed fishing spear is the right tool for you. Take a branch that’s durable enough and split one for about 6 inches long, as many times as you can. Sharpen the multi-heads of the spear and tie them last 2 – 3 firmly with the rope, to prevent them from splitting further and eventually breaking. 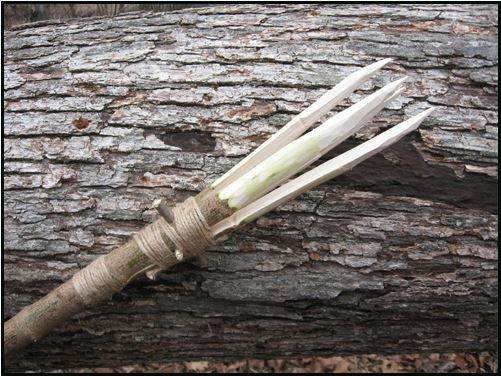 Now find a twig that’s strong enough to keep the “teeth” of the spear separated. You’ll not only hit your prey easily pierce it easily, but the shock from the hit will eject the twig, closing the “spear jaws”. That fish won’t know what hit him. Those of you who just can’t give up modern fishing or who simply find spearfishing too primitive can improvise their very own lures, lines, and fish hooks. Hooks are easiest to make. 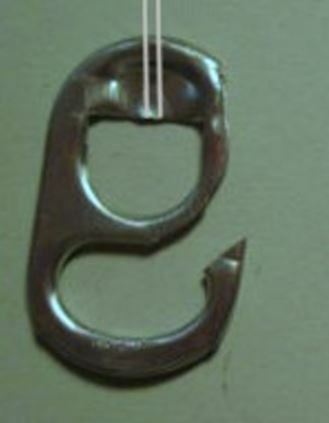 If you have a soda can in hand, you can cut the tab a pair of pliers or strong scissors into a hook shape. Anything goes if you are creative enough, from safety pins, nails or paper clips to thorns and bones. If you have a sharp knife on you and the patience to do it, you can make your very own toggle hook, used by our primitive ancestors. This is a 1-inch hook made from a durable material (bone, seashells or wood) that are sharpened at both ends and curbed. It’s attached to the fishing line by its midsection and hidden bait. When the prey swallows the bait, the hook jams in its throat. Bait shouldn’t be much of a problem, as there is plenty of natural bait around, even in urban environments. Fish tend to go for everything wiggling, so you’ll have no problem if you’ll be using grubs, ants, night crawlers, centipedes, millipedes, maggots, earthworms, caterpillars, beetles etc. If one type of bait doesn’t work, keep trying on until you find the right one. Considering you’ll be in survival situation, you might as well be fishing with multiple fishing lines. So trying out different types of bait such as sticky baits> and making a statistic shouldn’t be a long and lengthy process at all. Fishing line is probably the biggest challenge you’ll have to face. Although it’s hard to improvise, it’s not impossible. It can be made out of clothing material (ripped or torn), wire, twisted tree bark, dental floss and pretty much everything else that’s thin enough to attach itself to the fishing pole and strong enough to pull a fish out of the water. In some cases, this method can be more efficient than the traditional line and hook method. You can use clothing material or pretty much any material that’s strong enough for the job. You can attach two pieces at the extremities and simply walk around with the improvised net submerged. This is very practical if you’re using it in a small lake or stream, but not if you find yourself in the ocean. You’ll have to start from the deepest spot and work your way with the net still immersed to the shallowest spot. When you get there, close the net and pick it up quickly. It’s probably the most primitive fishing method available. But still, it works. This activity goes by many names (hogging, graveling, noodling, fish tickling etc.) 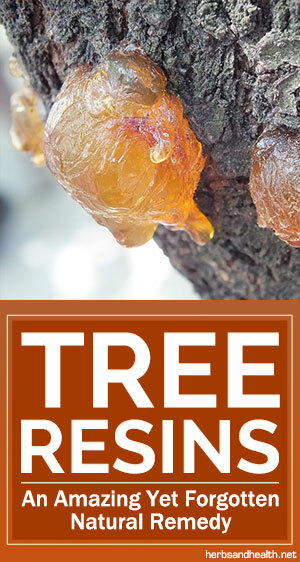 and it varies in technique from region to region. The easiest approach to hand fishing is to catch fish directly from their lairs or hideouts. Catfish are easiest to catch due to their considerable size (which makes them easy to hold) and their slow response. Just find a fish lair and rich in and grab the fish out. It’s best if you can grab a direct hold of the gills and or on the inside of the mouth. Just make sure that whatever it is you’re grabbing doesn’t have teeth or spikes. These are some of the easiest methods of fishing in a survival situation. There are more out there for you to discover. Many of them might not be legal in your state, but in an SHTF scenario, everything goes. So do not try them unless you don’t absolutely have to. In a survival situation, you’ll have to feed yourself and you might not have the luxury of being able to be picky. Unless you’re a skilled hunter, with limitless supplies of ammo, you’ll have to change your options a bit, from delicacies to pretty much what’s left that is edible. The truth of the matter is: if it’s meat, you can eat it for sustenance. Almost all animals are fit for consumption, with the exceptions of course of those who are poisonous or detrimental in other ways to human health. But the list is not that long, and if you are trained a bit recognizing the poisonous species from the safe ones, you will not go hungry or jeopardize your health. Just prepare yourself mentally and accept the fact that you might find yourself animals to catch and eat; animals that not only walk or fly, but also crawl, swim, or buzz. If you are strong enough to overcome this mental barrier, you’ll find that meat is meat, no matter the shape or size it comes in. In order to be as efficient as possible in gathering resources with the upmost of ease, you’ll need to read up a bit in the matter. Be aware of the animal life that’s native to your surroundings and know their lifestyle and patterns. So you’ll need to understand the behavior, food preferences, mating season and availability of a certain species. It’s important, as may prove very tricky to track down and hunt while others may be just sitting around for the taking. In principle, mammals are the best source of proteins available and to Americans is the food of choice. But hunting or procuring mammal meat has disadvantages also. Most of them won’t come without a fight and the amount of damage an animal can inflict is directly proportionate to its size. So if you’re planning on hunting large game, it’s advised you do so with professional hunting equipment. But it’s not always a matter of size, as even smaller mammals, like wild boars and even small rodents, can get very aggressive in order to protect their young. In a survival scenario, be very cautious as not to get bitten or scratched; an infected open wound is the last thing you need. Almost all mammals are edible without boundaries, with few exceptions: scavengers (most of them are carrying diseases), the platypus (it has poisonous glands), the polar bear (has dangerously high levels of vitamin A in the liver) and more. All species of birds are edible without boundaries and the only variables consist in size and flavor. As most of them fly, it’s very important to know and understand a species habits in order to catch them easily. The best ones to catch are the ones that don’t put much of a fight. So during night time, pigeons can be easily picked up by hand out of their nests. 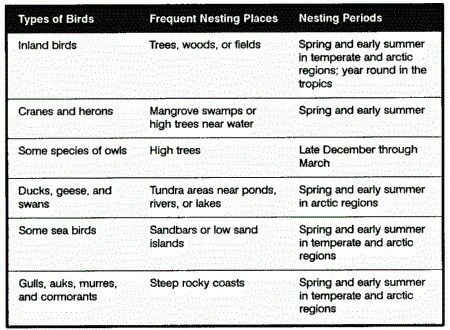 And many other types of birds won’t tend to fly away when nesting, even if they sense the danger. So picking them up it’s just a mere formality. Most birds have a clear pattern, which is easily observable. If you study them carefully enough, you’ll know when and where they fly out from the nest area, in order to drink or procure food. If the nesting area is out of reach, the drinking or feeding spot could become a possible hunting ground. Catching them is easily done by setting traps and snares. Fish meat is extremely nutritious; not only is it an excellent source of protein, but also of beneficial fasts. They’re usually more abundant then mammals and most ways of procuring fish are way easier than hinting. Here too comes in play the knowledge of the patterns and behaviors of species. For instance, almost all species tend to feed abundantly before storms, because right after a storm the water tends to get muddy and impure. So the best time for fishing is right before bad weather. If the water currents tend to get stronger than usual, fish tend to rest in “sanctuaries” where the water is calmer, like near rocks or other sturdy spots like logs, submerged foliage etc. They also have a tendency towards light during night time. 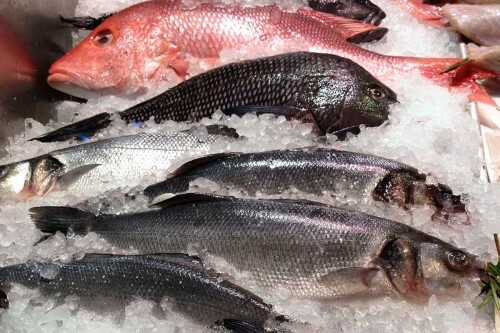 Salt-water fish can be poisonous, so you have to be aware of what you’re about to eat. Best stay away from species like red snapper, thorn fish, cowfish, puffer fish, porcupine fish etc. 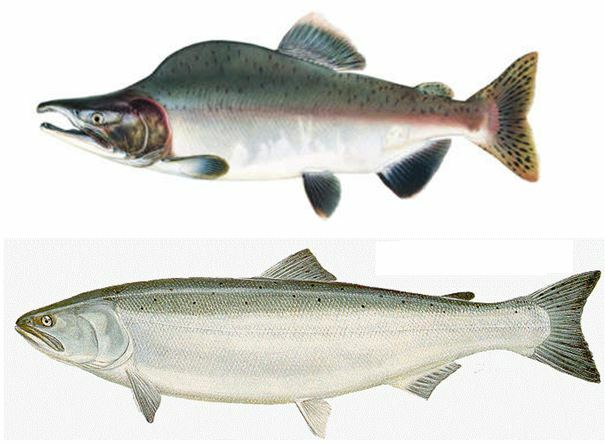 But the ones that are safe to eat, if you catch them further away from the shore, you can even eat raw. 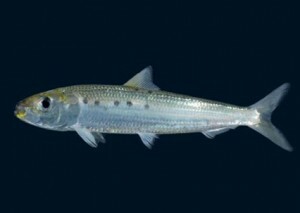 This is possible due to the high levels of salinity in deep waters, which prevents parasitic infestation. It’s a whole different story when it comes to fresh-water fish. All of them must be thoroughly cooked before eating, in order to kill off all the parasites. 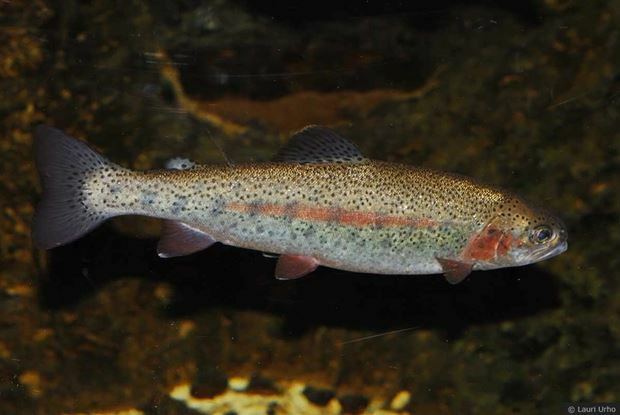 As an up-side, freshwater fish are never poisonous. But this doesn’t mean you don’t have to be cautious when it comes to wandering into fresh-water. 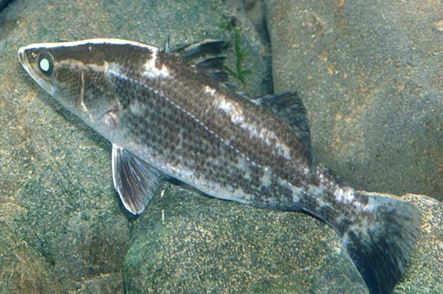 The catfish, for example, has very sharp needles in on its dorsal fin and barbels, which can deeply pierce into human flesh. So tread carefully and avoid painful wounds and infections. Most crustaceans are easy to spot and catch. The fresh-water shrimp can measure 0.25cm – 1 inch and can form large colonies or simply swim around vegetation. They can also be found in the mud vegetation of lakes. The larger crustaceans, like lobsters, crabs and shrimps are usually found where the water reaches about 30 feet deep. Lobsters and crabs are best caught during night time, with either a baited hook or a baited trap. Shrimp often comes at the surface of the water during night-time, attracted by light, making it easy for you to just scoop them up. Crayfish is also a great crustacean to have for breakfast, lunch or dinner. 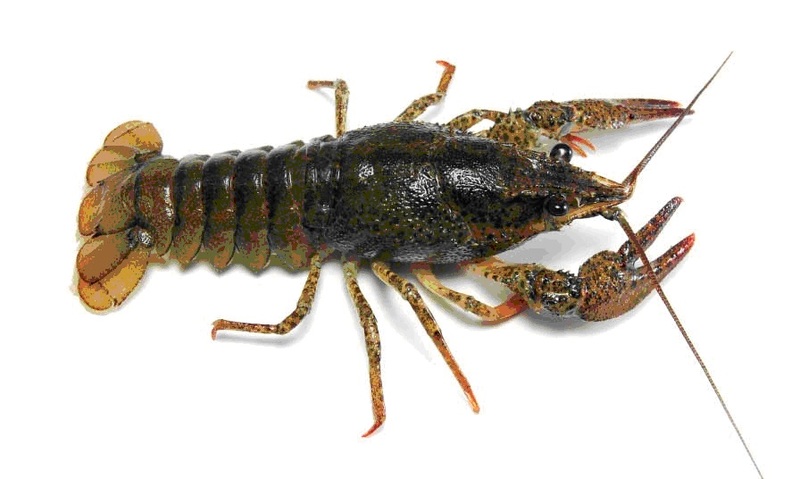 They’re akin to lobsters and crabs and can be found in the soft mud near the breathing holes of their nests or by round rocks in streams (but only during the daytime, since they’re active at night). They have a hard shell (exoskeleton), 10 legs and large pincers. They’re the most spread life form on Earth, and unlike beef which consists in about 20% protein, insects can pack up to 65% – 80% pure protein. And the best part is that they’re everywhere and very easy to catch. Grassy spots are usually a great place to pick up all sorts of insects and it makes it very easy to spot them. A rotting piece of wood, for example, may also be a great source for a large variety of insects such as ants, beetles, termites, grubs etc. You can also scout many other places that could naturally provide shelter or nesting places for the tiny critters. But many bugs do not come bug-free, as some of them (especially those with hard shells) will host a vast number of parasites. So if you plan on having beetles, grasshoppers or cicadas, don’t do so before cooking them. As much as they vary in shape as sizes, so do they in taste and texture. Eating them raw or cooked is one way to go, but another valid option is grinding them into a nutritious paste which you can mix with various herbs and spices, to add flavor. The ones that you have to avoid eating are the ones that usually sting or bite. The larvae are safe to eat though, as they haven’t developed the stingers or poison glands yet. Also, if they’re hairy or brightly colored, keep away, not only by eating them but also from touching or interacting with them. Also, spiders should be off-limits and all of the insects that are carriers of diseases like flies, mosquitoes, caterpillars etc. If you ever happen to find yourself in the situation of having to survive strictly on what Mother Nature provides, you’ll be just fine as you respect the basic set of written and unwritten natural rules. Just educate yourself on the matter, read up on specialized journals and articles in what’s safe to eat and what’s not and never take unnecessary risks. A wrong move might cost you your life.